Mera Peak is one of the most alluring trekking peaks in Nepal as it involves a culturally stimulating journey through remote picturesque villages and forests, followed by a gentle climb the summit. Mera Peak is perhaps best known because it is Nepal’s highest trekking peak and successful summits are rewarded with a spectacular panorama of five 8,000m peaks. The trip initiates in Kathmandu where we make preparations and enjoy the diversity of this ancient city before embarking on a flight into the town of Lukla in the Khumbu Valley, the entrance way to the Everest region. The cost of the expedition ex Kathmandu, Nepal is US$5,800 per person. The Expedition Trip Notes provide detailed information and background for Adventure Consultants' Mera Peak Expedition. For the Mera Peak climb we will take a maximum of 12 people hence spaces are limited. The expedition leader for our pre-monsoon departure is Dave McKinley, a multi-talented IFMGA guide with a wealth of guiding experience. Based in Twizel, New Zealand, Dave's guiding has taken him around the globe, and his notable summits include Everest, Lhotse, Manaslu, Denali, Aconcagua and Lobuche to name a few. This trip offers highlights of non-technical climbing at moderate to high altitude, and even though it is not technically difficult, the climb incorporates a lot of the components of the higher expedition peaks. An ascent of Mera Peak is regarded as the ideal introduction to Himalayan climbing. Whether you’ve climbed mountains before, or you just have aspirations to experience Himalayan expedition life, this introductory trip will enable you to truly savour the realities of expeditioning and many a Mera Peak climber has been inspired onto other high mountains. The climbing is low angle and involves the use of two camps on the mountain before making the attempt at the top. You will be supervised and supported by your qualified Western guide who will teach you the necessary skills while experiencing this fantastic and safe adventure. While previous mountaineering experience is not essential before attempting to climb Mera Peak, it is highly recommended. For a person who is regularly active in the outdoors with a reasonable amount of multi-day alpine ski touring or trekking with a backpack, Mera peak will not pose too many difficulties apart from the altitude component. For others who have little outdoor experience it would be extremely beneficial to partake in a basic mountaineering course prior to undertaking this trip. An introduction to basic snow craft and rope skills will be taught during the Mera Peak ascent by your guides. As with any foray into the mountains your fitness is a major contribution to enjoyment and success and for those not regularly exercising we recommend you sign up for a mountain-specific training program. On the trek into Base Camp you will carry a small daypack with your rain jacket, camera, water bottles and snacks. Bring trekking boots for the walk and some spare shoes for relaxing during the evening. In addition, you should have your own small personal medical kit to care for cuts, blisters etc. 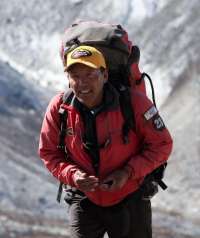 On the mountain, we have the luxury of a strong Sherpa team that will carry most of the team equipment, food and ropes. You are expected to carry your personal gear. This reinforces the need to take just the right amount of equipment with you on the mountain and to ensure you are ‘pack fit’ before you arrive on the expedition. See our Fitness Training Programs for information on how we can help you prepare for the expedition. The first ascent of Mera Peak was made by J.O.M Roberts and Sen Tenzing on 20 May 1953, using what has now become the standard route from Mera La. A subsequent ascent didn’t occur until 1975, when French climbers Jolly, Baus and Honills climbed the North Peak. Food will be of the highest standard possible, given the remoteness of the situation. We will take meals in lodges and teahouses along the trail and will supplement this with some of our favourite imported snacks and coffee! On the mountain we usually have MREs (Meals, Ready-to-Eat) which are significantly tastier than freeze-dried food, as they are real food vacuum sealed and ready to heat and eat! We are able to accommodate most dietary requirements but do please inform us in advance. You will be met from your flight into Kathmandu by our staff then we all congregate at our hotel for a comprehensive briefing for the trip. This also provides an opportunity to check personal equipment. There are plentiful stores with trekking equipment available for purchase so anything forgotten is soon replaced. On the day following your arrival and after our preparations are finalised, we make the best of our opportunity to visit some of the incredible sites in the Kathmandu valley when we visit Monasteries and sacred sites. A quick walk up the steps to the Monkey Temple always gets the blood flowing! Our flight to Lukla comes very early in the morning to make the best of the stable morning weather patterns and before long we are enjoying the scenic wonders of the Himalaya as we begin our trek to Paiyu. Initially, we head down the valley, away from the popular and often busy Khumbu Valley and Everest region to Paiyu and Panggom. Now we can we enjoy the isolated, rarely visited villages before crossing the Panggom La and down through the Rhododendron jungle. Over the next few days, we trek up through the phenomenal virgin forest, climbing above the treeline to a series of alpine lakes, before descending once more to the valley which opens up give us amazing views of the surrounding mountains, including our objective, Mera Peak. Although strenuous at times, our acclimatisation is greatly aided by this foray above 4000m. Tangnag is a great place for a rest day and an opportunity to take in the surroundings. From here we head off for an acclimatisation hike up towards the Base Camp of one of Nepal’s most challenging trekking peaks, Kusum Kanguru. We depart Tangnag to climb up the valley and through lateral moraine and grassy meadows to Mera base camp which is a small village called Kharre, 4800m. As we ascend, some of our climbing route will come into view, looking much easier than the south face we’ve been walking around. We utilise some time at base camp for further preparations including revisions and instruction in the use of climbing harness, crampons and axe. We’ll practice travelling roped up and prepare our mountain equipment. The route we take is reasonably straightforward, but it is preferable to learn the techniques in a comfortable environment. There is sometimes one small portion of fixed rope near the summit, so instruction will be given in this technique also. We move up to a snow covered camp on the Mera La saddle at approx 5,400m. Making the final approach to the summit reveals an amazing panorama of the highest mountains on earth: Makalu (8,481m) and Everest (8,850m), looming over peaks like Baruntse (7,129m), Chamlang (7,319m) and Nau Lekh (6,360m). We aim to make the summit early to mid-morning and return to base camp that afternoon/evening. After the climb, we descend to Mosom Kharka and the next day have a short walk through the forest to Tashing Dingma and climb up to Thuli Kharka the following day. We then have an early start for our crossing of the Zatrwa La pass. Depending on conditions we may fix a rope on the steeper section and care is required if there has been recent snowfall. We descend to Chutanga and then the next day have an easy walk into Lukla for our flight to Kathmandu and a celebratory meal back in the lively city. The following day the trip finishes and your guide will coordinate airport drop offs for your flight home. I think AC is extremely professional at all levels from the support provided leading up to the trip, the ease of contacting the NZ office and quick responses through to the guide and support team (Sherpas, Porters) on the trail. AC is also well respected in Nepal and you see this through the interaction with the local communities.